A banned motorist reached a speed of 90 mph in an attempt to get away from pursuing police officers, Lincoln Crown Court was told. Lewis Perkins was spotted by an officer as he drove along Chapel Street, Market Rasen, but when the officer approached him Perkins sped off down Oxford Street in the town. Edna Leonard, prosecuting, said the officer activated blue lights and the sirens on his police vehicle, but Perkins did not stop and instead went through a red traffic light. The officer followed Perkins along Waterloo Street, Church Lane and on to Caistor Road as Perkins reached 60 mph. Miss Leonard said “Other motorists were having to take avoiding action. “When he was out of the built-up area, he was driving at speeds in excess of 90 mph. “Eventually he crashed into a road sign causing his vehicle to come to a stop. The court was told that Perkins was under a six-month driving ban at the time. 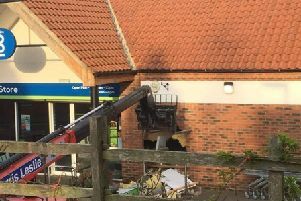 Perkins , 21, whose address was given as c/o Coronation Road, Market Rasen, admitted charges of dangerous driving, driving while disqualified and driving without insurance as a result of the incident on April 22 this year. He was given a nine-month jail sentence suspended for 12 months, with 150 hours of unpaid work. He was banned from driving for 12 months and ordered to complete an extended retest before he can drive again. He said that Perkins had separated from his girlfriend and was subsequently “sofa surfing” without a permanent address. As a result he did not attend the court hearing where he was banned from driving and the matter had gone ahead without him being present.